Most of us have activities or smells that make us think of childhood. Or an action or event will remind us of the past. 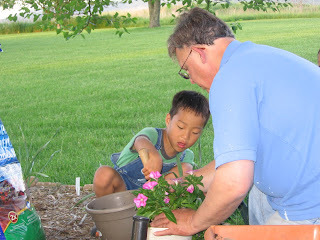 One of those memories for me is dad and gardening. 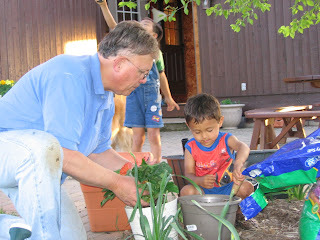 My dad loves to garden and I can remember helping to plant flowers or vegetables. I can also saying I would never pick another strawberry or pull another weed and yet I do now and enjoy it for the most part. A couple of these pictures are almost exact replicas of ones that are found in mine and my siblings scrapbook. 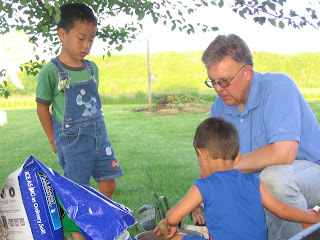 Well my dad now known as grandpop is passing on his love of all things growing to my children. So here are a passing on of a gift to the next generation. Love it! I have a few precious memories of time spent with my grandparents at an early age like that. 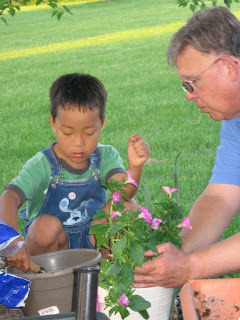 I think I appreciate those times more now that I'm a mom and my boys get little time with their grandparents. Enjoy!